Virgina Adams of the VFW Auxiliary spoke about the importance of respecting the flag and remembering those who have served in the Armed Forces. Each kindergarten class was invited to say the pledge of allegiance together, which they have been practicing since the beginning of the school year. Afterward, students were given a flag and an accomplishment award to take home. 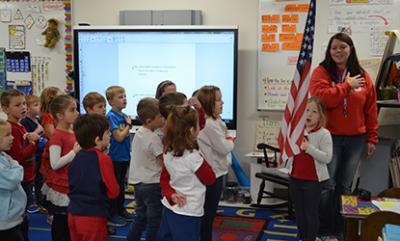 Kim Borka’s GSL kindergarten class says the pledge of allegiance while Rayna Schaefer holds the flag.